PLEASE HELP TO KEEP OUR CLASSES SCENT FREE! CANCELLATIONS: No classes on April 19 at Shima and Monday, April 22 at Oliver Woods. 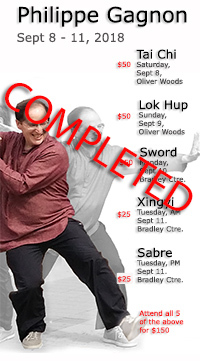 NEW BEGINNER TAICHI Classes: Starting week of May 6th. $60 for 14 week session. 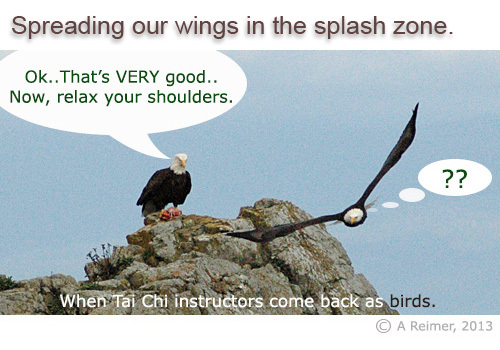 Sabre & Tai Chi in the splash zone every Monday morning, year round at Neck Point. A morning class is being held here year round every Monday, weather permitting or sometimes even without permission. This is a wonderful outdoor setting to practice Tai Chi even on a chilly January morning. It's also a great place to walk, or sit and watch the wildlife. With sea lions, oystercatchers, eagles, herons, cormorants, gulls, orcas, etc., frequenting the area, this is also a wildlife viewing experience but in this case, the wildlife is viewing us. Join us for a walk and/or coffee down the road after class. 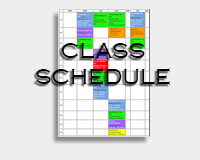 Please see the class schedule for up to date information on all classes. 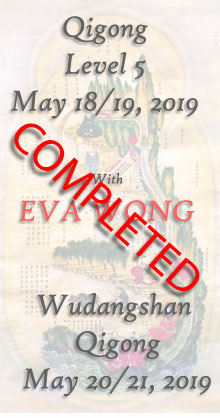 © Tai Chi Nanaimo Association, 2019. All rights reserved.